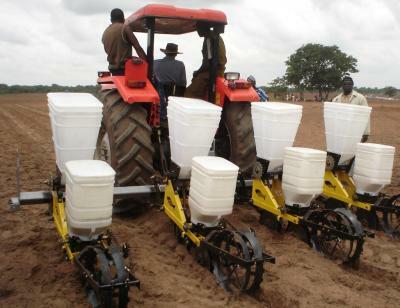 After inviting Zimbabwean farmers to Nigeria, agriculture in Kwara state has been revived. Will the lessons be heeded by the federal government? Seven years ago, then governor of Kwara State Bukola Saraki made a headline-grabbing move: he offered a new life in Nigeria to 13 white Zimbabwean farmers. Saraki wanted to combine the farmers’ expertise with a public-private partnership and using the state as an “active development agent” to reignite an ailing agricultural sector. Last month, at Chatham House in London, Saraki outlined how the national government could look to Kwara’s successes to gain a “competitive edge from the comparative advantage” Nigeria has in agriculture and reach self-sufficiency in food by 2015. While some 70% of Nigerians engage in farming, about 70% of Nigerians are estimated to live in poverty, overwhelmingly concentrated in rural areas. Currently, 34% of Nigerians can not attain sufficient calories even if they spend all their income on food. For many local farmers, access to credit to buy mechanical equipment is unavailable due to banks preferring trade financing or cannot be accessed due to illiteracy. And when farmers produce a surplus, lack of infrastructure and storage facilities can prevent the sale of crops. Until the 1970s agricultural exports were at the heart of the Nigerian economy. After the discovery of oil and an accompanying policy shift towards encouraging industrialisation, investment in agriculture dropped off. Nigerian economic growth exceeded 7% a year at the time, and better management of oil revenue – stockpiling foreign exchange reserves and paying off foreign debt – would haveleft more capital available for investment in agriculture.Domestic food prices rose through the decade, while food crop production fell and the growth rate for export crops plummeted: Nigerian agriculture suffered from an “extraordinary decline” from 1970 to 1982. A series of failed policy attempts followed under successive heads of state – Gowon, Obasanjo, Shagari, Buhari and Babangida – wasted billions of Naira with no tangible improvements to the sector or the rural poor. A failure to boost productivity exacerbated high labour costs. A lack of positive production incentives for export crops was followed by subsidies not being enough to offset the effects of the oil boom and trade and exchange rate policies. As Goodluck Jonathan recently acknowledged: “We had Operation Feed the Nation (OFN), we had Green Revolution and yet we are still importing rice.” Recent strategies such as the New Agricultural Policy of 2001 address the link between agriculture and poverty reduction, but are criticised for leaving “grey areas”, and noted for their lack of monitoring and evaluation. RELATED POST: Nigeria's APC: A Progressive Change or A Powerless Coalition? When Saraki came into office in 2003 he wanted to use agriculture to tackle the entrenched poverty in Kwara. While 75% of land in Kwara is cultivatable, at the time only 11% was under cultivation. Saraki’s first attempt at harnessing the state’s untapped potential was through “Back-To-Farm”. The state gave out money to farmers to prepare land, and provided seedlings, chemicals and fertilisers. The project failed: Saraki argues that the majority of farmers were old and lacked education – hampering access to credit – were reluctant to use fertilisers, saw money handouts as a “dividend of democracy” and lacked the commitment to pay back money or justify it through results, while the agriculture ministry that oversaw the project lacked the necessary training and experience. “We realised a fundamental mistake we made: we tried to mount a new carriage on an old horse that was also ill,” he said. Saraki turned to commercial farming. He created Shonga Farms as a “Special Purpose Vehicle” in order to gain financing from five banks through debt and equity financing options. He made contact with the Commercial Farmers Union of Zimbabwe – by 2004 a memorandum of understanding had been signed, and by 2005, after the state stepped in to clear land and provide fertilisers and insecticides,13 Zimbabwean farmers were running five dairy, four poultry and four mixed farms in the new Shonga project, each with 1,000 hectares of land under a 25-year renewable lease. The impact of the farmers was transformative. The ‘Shonga’ farms now employ up to 4,000 people at harvest time. Crops include maize, soya beans, rice, peas, bananas, ginger and pineapples, and crop yields are increasing every year: rice yields are more than double the national average of 1.5 tonnes per hectare, maize, at 5 tonnes per hectare far exceeds the national average of 1.2, while on what is now Nigeria’s largest cassava farm 40 to 60 tonnes per hectare of crop are produced a year, as compared to the national average of 12 to 15 tonnes. Such is the success of the cassava farm that Nigerian Starch Mills is currently building a processing factory nearby. Shonga is home to a factory which is Nigeria’s largest exporter of processed cashew nuts and the largest milk producing dairy farm of its kind in the country. Climate-controlled poultry houses are under construction, along with a N2.9 billion (about $1.8 million) irrigation project which will increase the yields of the two-thirds of farmland not currently irrigated. The changes have been noticed by locals. An elder from a village in the Shonga farms said in 2009: “We now have electricity, our health is improving because we have a new clinic and water, some of our sons and wives have found work on the farms.” And a critical element of the project is ensuring that local Nigerians can continue the work of the Zimbabweans – as Saraki has noted, young Nigerians are not attracted by a profession which failed to lift their parents from poverty: the Malete Integrated Youth Farm Centre was established in order to ensure that new cohorts of Nigerian graduates are trained in modern farming techniques. “The future of Africa depends on the capacity to create jobs and prosperity,” Saraki said at Chatham House. In Nigeria, this prosperity cannot be created without attending to the needs of agriculture. Domestic production will lower food prices and boost domestic demand, while increases in productivity will free up labour for non-agricultural employment and create a surplus for the industries needed for Nigeria’s next stage of growth. State-led agricultural development pushed some East and Southeast Asian countries from being poorer than sub-Saharan Africa 50 years ago to far richer now. Added value in – largely smallholder – Taiwanese agriculture doubled in the 25 years to 1938 fuelled by technological change from investments by colonial power Japan in rice varieties, fertilisers, irrigation and infrastructure. While a range of other factors – including Cold War aid disbursement, colonial and post-colonial education policy, export orientation and technocratic expertise – propelled Taiwan’s phenomenal economic development and shift to a technology-intensive economy, agricultural development was the foundation. While issues like the continued provision of subsidies to European farmers through the Common Agricultural Policy remain problematic and out of Nigeria’s control, state spending on agriculture must increase: government funding has been equivalent to the amount spent on building a road from Abuja to its airport. Government policy is crucial for the provision of rural infrastructure, research and a reliable rural power supply. Monetary policies must combat the negative impact on agriculture of high inflation and high interest rates and the phenomenon of “Dutch Disease” – the negative impact an appreciating exchange rate caused by oil can have on non-resource based sectors.And the returns from investment in agriculture are better than might be expected: some subsectors of agriculture in Nigeria such as cattle, fruit and vegetables outperform oil and manufacturing sectors in terms of return to investment, while “technological improvements related to unskilled labor produced the highest returns in agriculture compared to any other sector”. “As a country we have not focused on agriculture,” says Saraki. “As a government, we need to provide an enabling environment. In 2005, Saraki said: “Kwara will be the backbone for Nigeria’s agricultural drive.”And as he outlined in London, after coming into power Saraki aimed to make the local state an “active development agent”. In order for Nigeria as a whole to reap the benefits of its comparative advantage in agriculture and take the rural population from poverty to prosperity, Goodluck Jonathan will have to do much the same with the national state.